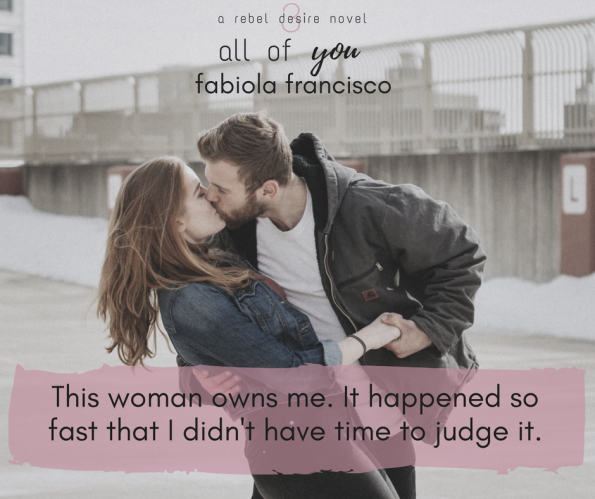 Review – All of You by Fabiola Francisco – 5 Breath-Taking, Heart-Warming, Magical Stars!!! 5 Breath-Taking, Heart-Warming, Magical Stars!!! When Jason spotted Cassidy Rae the connection he felt was undeniable. The heart wants, what the hearts wants, and Jason’s heart wants Cassidy Rae. Can she let him in and believe they have what it takes to be together or will her past catch up with her and tear them apart? Fabiola Francisco has written a beautiful, captivating, romantic story, one that held my heart hostage from start to finish. All of You is a beautiful, and magical, story. Watching the love and connection they shared unfold was both heart-breaking and breath-taking. I didn’t want this story to end; Jason’s story is one, I couldn’t ever get enough off. I love the spin Fabiola Francisco created with this story, and I hope it gives those in the same situation, hope that things can get better, that fairy tales might just exist. Jason won my heart over, again and again. He wasn’t judgemental or demanding. He opened his heart to Cassidy Rae and her little girl and wasn’t afraid to do so. His patience, love and understanding for Cassidy Rae and her family went above and beyond. I loved Jason, he gave me all the feels and totally stole my heart, he is without a doubt my favourite member of Rebel Desire. Cassidy Rae was a strong, compassionate woman, who put the love and care of her family before her own. I really liked her character, and my heart broke for her. To have the strength she did, and still be standing was an inspiration. One thing that truly stood out for me in this story, was when misunderstandings occurred, both Jason and Cassidy Rae talked; there wasn’t unnecessary drama. This story was perfect from start to finish. If you enjoy contemporary romances, that captivate you, the Rebel Desire series is for you. Although this book can be read as a standalone, I personally feel to get the full enjoyment from this story, you need to read the series in order; starting with book #1, Lovin’ on You.